Without wanting to give anything away, Lines in the Sand achieves something unique. The audience is left to wonder where the hell we are and what the hell is happening. As we uneasily let our minds race in all directions, trying to second-guess the clever writing of Jim Dalglish is impossible. Nick Bucchianeri (Boy) should be applauded. A skilful and natural young actor, being given such layered and challenging material at such an age demonstrates how talented he really is. Tony Travastino (Man) doesn’t go easy on him either and it’s his confident and unwavering approach, to play the truth of his character – without compromise, that grips you right from the opening scene. Whilst cleverly twisting and turning, at times, Boy seems to break into heartfelt monologue with insight and knowledge way beyond his years and his character arc seems somewhat implausible at times, given that these events only happen over one night. This really should be a full length production where character progression can be slowed, ensuring we see all the stages of how these two men deal with their unexpected meeting. Where this play ultimately succeeds however is in is how it deals with the detail of what has happened surrounding this story. As an audience, we are left to conjure up our own images. It is this clever technique, utilizing the audience’s ability to imagine what they don’t want to imagine that raises the stakes, taking us with these characters and makes us care as if we were there. 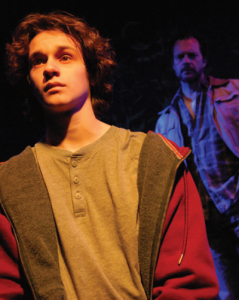 A brave psychological thriller, Lines in the Sand explores the struggles of growing up gay and the dangers boys and young men face whilst they try to desperately ‘find a place where you aren’t afraid to be who you are inside’.